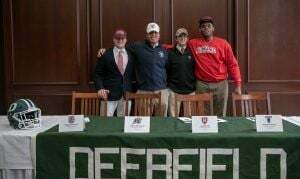 Today on National Letter of Intent signing day, we celebrated four Deerfield student-athletes who committed to playing collegiate football. 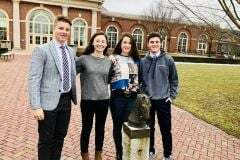 In the fall of 2019, Jackson McCarty ’19 will join the Merrimack College Warriors, Jack Bill ’19 will become a member of the Harvard Crimson, Trumayne Guy ’19 will play for the Howard Bison and William Kolman ’19 will become a Colgate Raider. This fall, the Big Green football team posted a 6-3 season record that included a four-game winning streak that started with the September 29th win at Hotchkiss, 13-7, and continued through October 20th for the Big Green’s come from behind win at Exeter, 37-14. 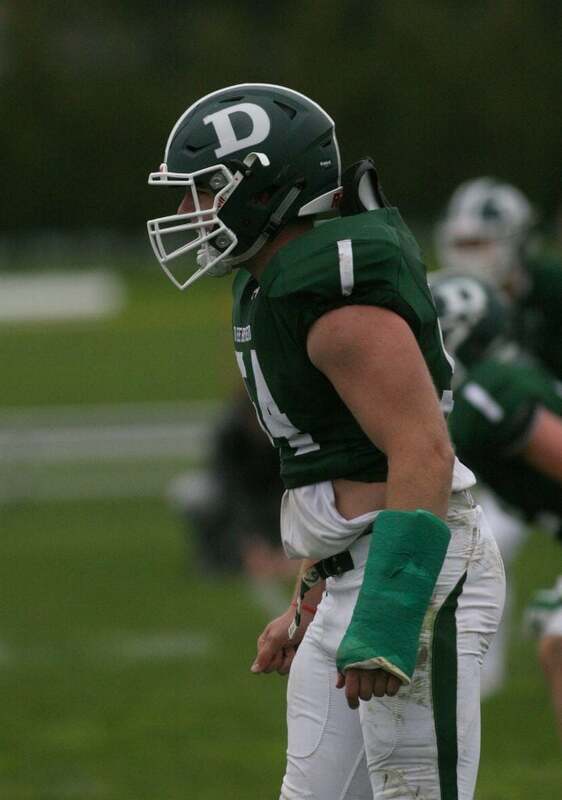 In his final season for the Big Green Jackson McCarty led the 2018 DA football team in many ways; the senior captain from York, ME anchored the Big Green’s offensive and defensive lines. 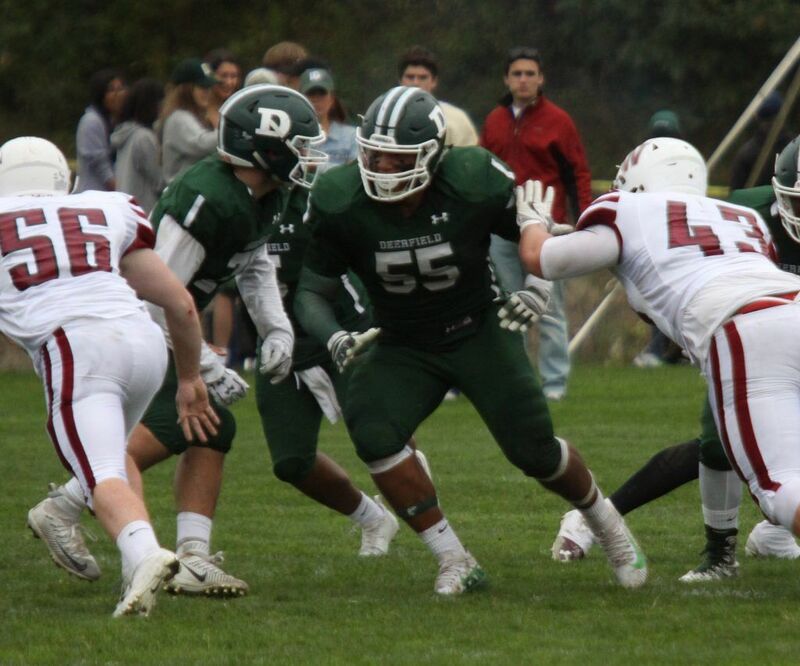 Jackson is an athletic and physical player with a high motor who produced against both the run and pass as one of the best lineman in NEPSAC football. This season, Jackson was recognized as a 1st team All CNEFL offensive lineman and was a 1st team all NEPSAC selection on the defensive line. In 2017, Jackson received 2nd team All CNEFL offensive line for his contributions on the offensive line for the Big Green. Prior to joining the Big Green in the fall of 2017, Jackson was a three-year member of the varsity football team at York High School. At Deerfield, Jackson is also a contributor on the boys varsity basketball team. Next fall, Jackson will join the Merrimack College Warriors who posted a 5-5 record this fall and finished 5th in the final Northeast-10 Conference rankings. Good luck Jackson! At quarterback, Jack Bill has led the Big Green offensive for the past 2 seasons. 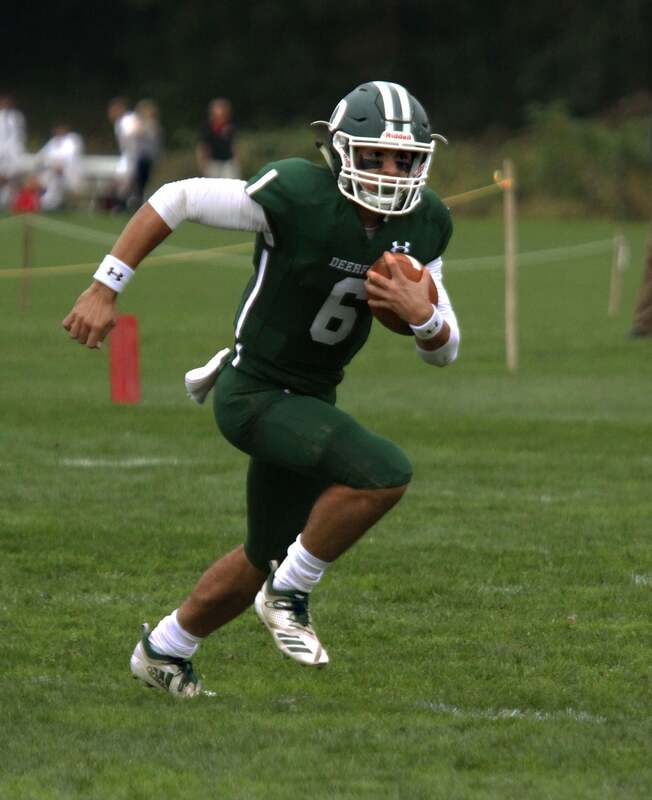 The senior quarterback from Huntington, NY was one of the most productive players in NEPSAC football where he led the big green in both passing and rushing yards. This year, he was selected as 2nd team All CNEFL as well as 1st team All NEPSAC at quarterback. In his senior season, Jack’s best performance came in the team’s 34-14 upset win over Cheshire Academy. Prior to joining the Big Green in the fall of 2017, Jack, as a junior, helped lead the Garden City High School football team to a 12-0 season, a Long Island Championship, and captured the Rutger’s Cup, awarded to the best football team in Nassau County. Furthermore, Jack earned offensive MVP of the 2016 Nassau County Championship Game. 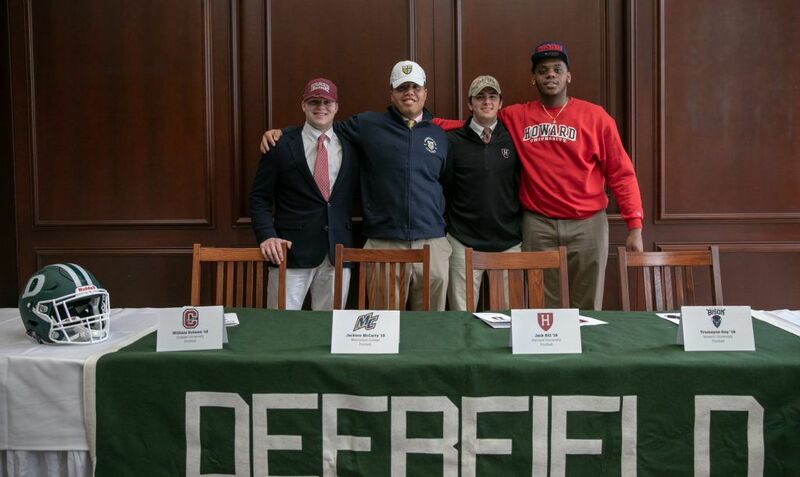 At Deerfield, Jack is also a contributing player on the boys varsity lacrosse team. In fall 2019, Jack will join the Harvard Crimson football program, perennial Ivy League championship contenders. This season, the Crimson posted a 6-4 season record and ended their season defeating Yale 45-27. Go Crimson! 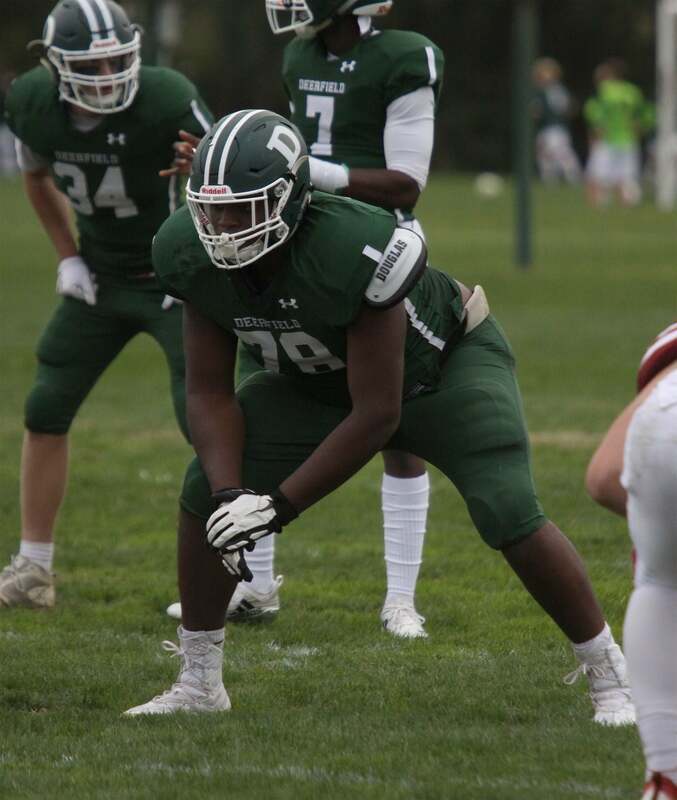 A post-graduate student-athlete from Braintree High School, Trumayne had a dominant season for the Big Green, pacing the Deerfield offensive line at left tackle. He stymied opposing pass rushes while paving holes for the team’s run game. For his contributions on the field this season, Trumayne was selected 1st team All CNEFL offensive lineman. Prior to Deerfield, Trumayne was a three-time varsity letterman in football for Braintree High School, where he was elected senior captain, and received Bay State Conference All-League. He was also a two-time varsity letterman in basketball. Trumayne also competes for the Big Green boys varsity basketball team. Trumayne is excited to major in Communications at Howard University next fall and will play for new Bison head coach, Ron Prince. This season, the Bison were 4-6 overall and compete in the DI Football Championship Subdivision Mid-Eastern Athletic Conference. Best of luck Trumayne! A four-year letter winner in football, William had a breakout junior campaign for the Big Green in fall 2017. An inside linebacker from Greenwich, CT, in his junior season, William helped the Doors post a 6-2 regular season record and were awarded post-season selection in the Mike Atkins Bowl Game. For his contributions on the field in 2017, he received All CNEFL 2nd team accolades. Entering his senior campaign, William was voted a senior captain by his teammates and was nominated to the Mass Preps magazine 2018 preseason super-team. Next fall, William will join the Colgate football program. In 2018, the Raiders posted a 10-2 season record and advanced to the NCAA DI Football Championship Subdivision quarterfinals. Go ‘Gate! Today’s signees will join 12 other Big Green senior student-athletes who committed during at the November signing day. 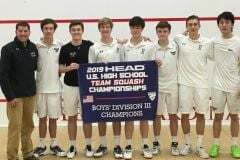 Congratulations to Jackson, Jack, Trumayne and William on your commitment to continue your pursuit of a sport you love at the collegiate level! We look forward to cheering you on at the next level.